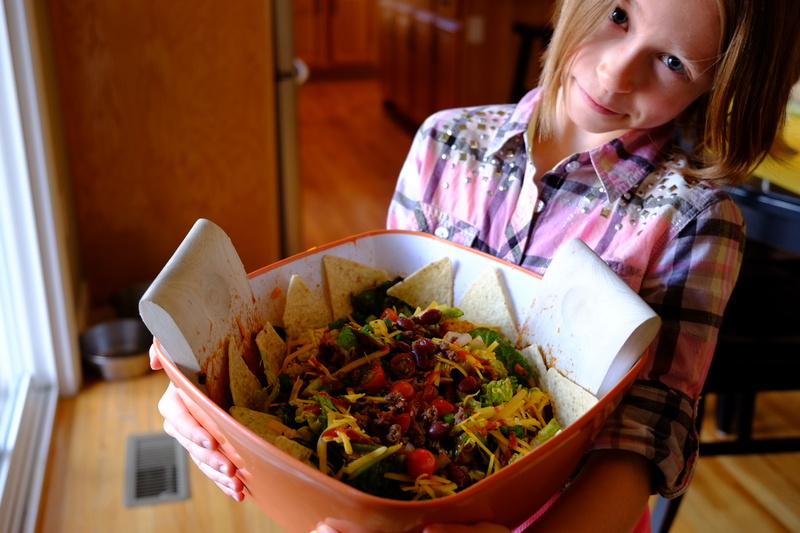 (MARINA) When my mom was my age she used to eat this salad – Taco Salad with Russian Dressing. That was a long time ago! The one thing about this main-dish salad that surprised everyone in my family was the temperature. It’s not cold like a typical salad. The cooked ground beef and warm beans make everything else perfectly room temperature. Even the chips are warm! The chips get a little bit soggy but in a good way. You crunch them up and toss them in, and the dressing soaks into them. 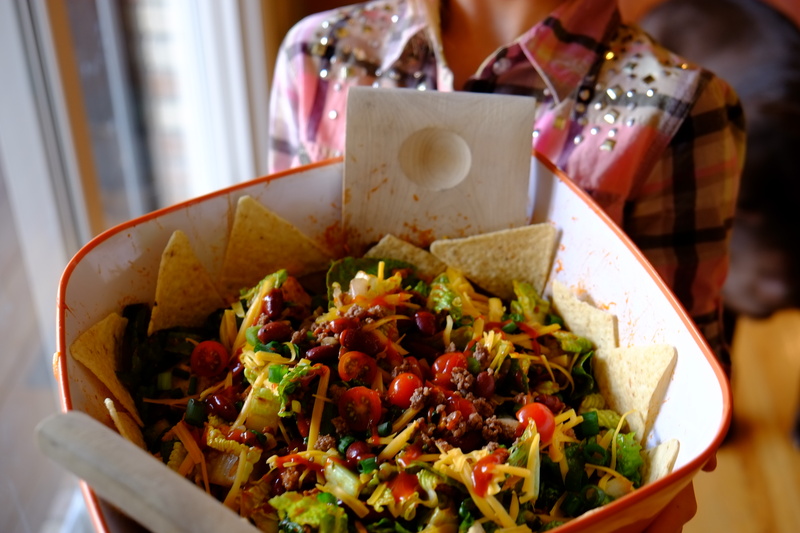 As a finishing touch, you stack up chips all around the bowl. I like the white corn chips but my mom likes blue corn chips: It is your choice. The beans and the meat are really excellent in this salad because they partner well together, and with the rest of the ingredients. This Taco Salad with Russian Dressing is the best salad I have ever had. (KERI) It’s Throwback Thursday, and I’m on stay-cation. This means I have time on my hands. To think about food. To cook. And to reminisce. 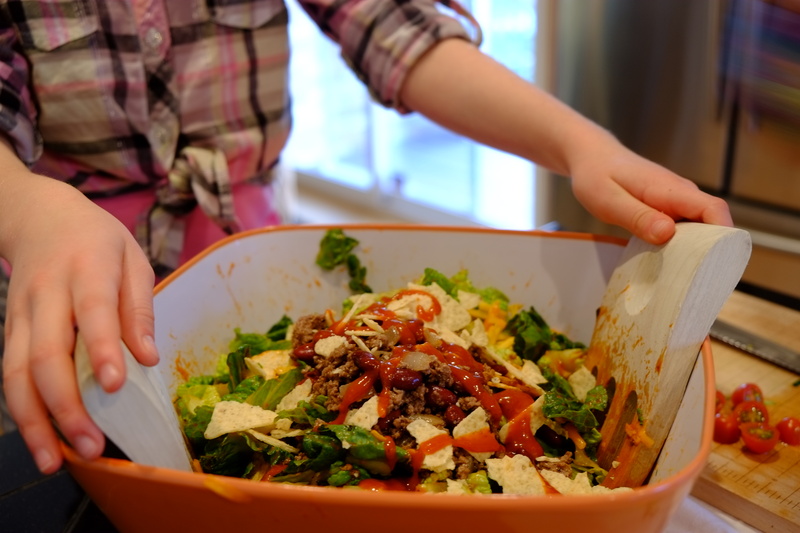 I decided to get in the spirit and make one of my favorite childhood dishes: My mom’s Taco Salad with Russian Dressing. I can’t remember when my mom started making it, but it was somewhere between my braces and big hair. As you read the ingredients – ground beef, deconstructed chips, Russian dressing, cheddar, Romaine – it sounds so very retro. But I’ve tweaked it here and there and pulled it into modern day. The taste is a wonderful balance between savory and sweet (thanks to the Russian dressing), cool and warm. Plus: It’s a main dish salad. Plus plus: It whips together faster than you can say AquaNet. I remember when I was in college, living in my first apartment. With the ability to cook for myself, I craved my mom’s recipes. I would call home and ask for ‘that goulash recipe,’ or ‘your chocolate chip cookie secret?’ Please send, Mom, along with a baked batch. This salad was one of those I recipes I wanted to make for myself, in my own kitchen, with my roomie. Just to taste home, while feeling just a little homesick for dinner with my family. I don’t need the recipe anymore – it’s sauteed in my brain – but I found it today, in honor of Throwback Thursday. Handwritten on a recipe card by Mom. Sent via snail mail. There was no email then. I love the note at the top (‘Keri: green onions are GOOD’). Once upon a time, I detested onions. I would pick them out of everything. I got over that. And my big hair. But never this salad. It’s a regular at my kitchen table. My two bites now savor it the way I did, and still do today. I can’t wait for Marina to call for the recipe. Or email. Or text. Or will all of that be throwback in nine years? Heat olive oil in a large skillet over medium heat. Add onions and saute until just starting to brown, about 8 minutes. Add ground beef and break up with a wooden spoon. Add chili powder, cumin, salt and pepper. Cook until beef is cooked through and no longer pink, about 10 minutes. Add kidney beans and heat until beans are warm. Turn heat down to low. 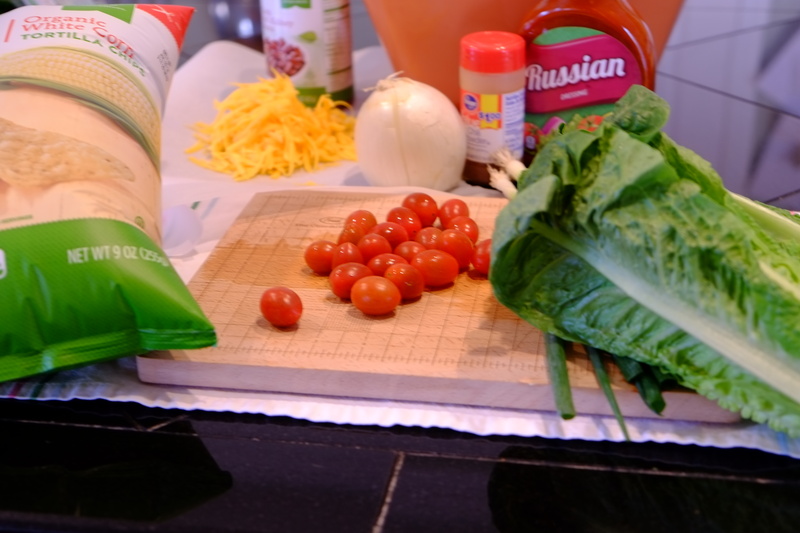 Meanwhile, toss Romaine, all but one Tablespoon of sliced scallions, the tomatoes, 1 cup of the cheese and most of the chips with 3 ounces of the dressing. Ensure everything is coated in dressing. Add the beef and bean mixture along with the rest of the dressing and toss. Add more dressing if the salad is too dry – you need to be able to see that ketchup red dressing on everything. Stack whole chips around the perimeter of the salad and sprinkle with the remaining cheese and scallions and a few drops of dressing. Serve immediately. 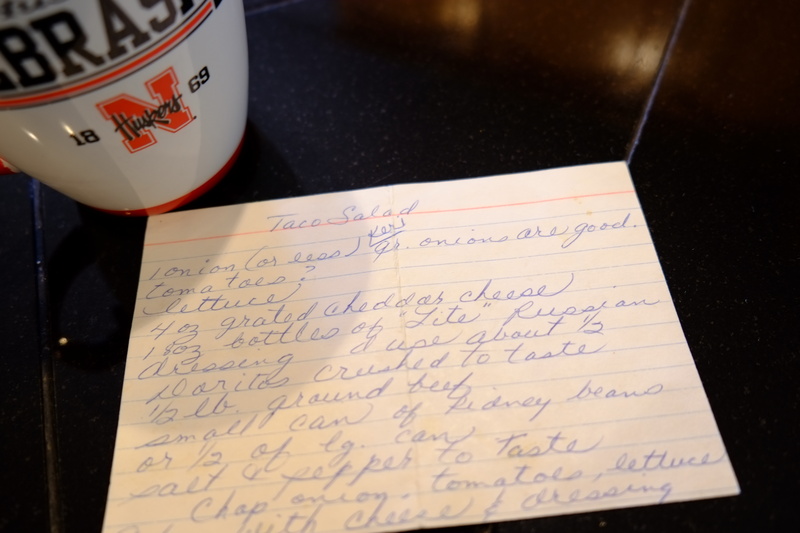 This entry was posted in Main Dishes, Salads and tagged Russian Dressing, Taco Salad. Bookmark the permalink. Ok, so I really need to hear the story about getting over the detestation of onions! What?!? Love your a nd Marina’s blog! Miss you!